The semilunar valves allow blood to be pumped into the major arteries while preventing backflow of blood from the arteries into the ventricles. The semilunar valves act to prevent backflow of blood from the arteries to the ventricles during ventricular diastole and help maintain pressure on the major arteries. The aortic semilunar valve separates the left ventricle from the opening of the aorta. The aortic and pulmonary valves are semilunar valves which separate the ventricles from the aorta and pulmonary artery, respectively. Partial pressure gradient changes during systole and diastole cause the opening and closing of the valves. Valve stenosis is when valves narrow and can’t open fully, while regurgitation is when they cannot close completely. In both instances, the heart must work harder to compensate for the faulty valves. semilunar valves: Located at the base of both the trunk of the pulmonary artery and the aorta, and prevent backflow of blood from the arteries into the ventricles. stenosis: The narrowing of valves, which prevents them from opening completely. The semilunar valves are located at the connections between the pulmonary artery and the right ventricle, and the aorta and the left ventricle. These valves allow blood to be pumped forward into the arteries, but prevent backflow of blood from the arteries into the ventricles. These valves do not have subvalvular apparatus and are more similar to the semilunar valves in veins and lymphatic vessels than to atrioventricular (AV) valves. The semilunar valves act in concert with the AV valves to direct blood flow through the heart. When the atrioventricular valves are open, the semi lunar valves are shut and blood is forced into the ventricles. When the AV valves shut, the semilunar valves open, forcing blood into the aorta and pulmonary artery. The mechanism for this process depends on blood pressure gradients in the heart, which provide the force that pushes blood through the semilunar valves. The aortic valve separates the left ventricle from the aorta and has three cusps. During ventricular systole, pressure rises in the left ventricle. When the pressure in the left ventricle exceeds the pressure in the aorta, the aortic valve opens and blood flows from the left ventricle into the aorta. When ventricular systole ends, pressure in the left ventricle drops rapidly, and the valve closes due to a lack of pressure imposed on them from the left ventricle. Blood pressure within the aorta following systole also causes the closing of the valve. The closing of the aortic valve produces a sound that is a component of the second heart sound. 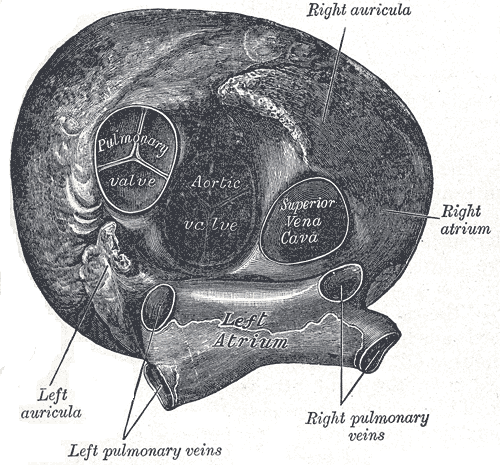 Heart viewed from above: This anterior view of the heart indicates the semilunar valves, and the aortic and pulmonary valves. The pulmonary valve (also called the pulmonic valve), which also has three cusps, separates the right ventricle from the pulmonary artery. Similar to the aortic valve, the pulmonary valve opens in ventricular systole, when the pressure in the right ventricle exceeds the pressure in the pulmonary artery. When ventricular systole ends, pressure in the right ventricle drops rapidly, and the pressure in the pulmonary artery forces the pulmonary valve to close. The closure of the pulmonary valve also produces a sound, however it is softer than the aortic sound because the blood pressure in the right side of the heart is lower compared to the left side, due to the differences between pulmonary and systemic circulation. Valves are vulnerable to several conditions that impair their normal functions. Two of the most common problems with the semilunar valves are stenosis and regurgitation. Valve stenosis refers to narrowing of the valves, which prevents the valve from opening fully, causing an obstruction of blood flow. Valve stenosis is often caused by calcium buildup and scarring from rheumatic fever, and may cause cardiac hypertrophy and heart failure. Valve regurgitation is backflow through the valves that occurs when when they cannot close completely. It is the cause of most heart murmurs, and is generally a minor problem, but if severe enough, it can cause heart failure. Stenosis and regurgitation can occur in both the semilunar and atrioventricular valves.